Polar ice forms because as high latitude regions the poles receive less solar radiation than equatorial regions, resulting in lower temperatures. Sea ice is frozen ocean water. Icebergs, glaciers, and ice shelves float in the ocean but originate on land. Sea ice cools the poles, but also moderates global climate. Polar bears 280 miles from the North Pole. 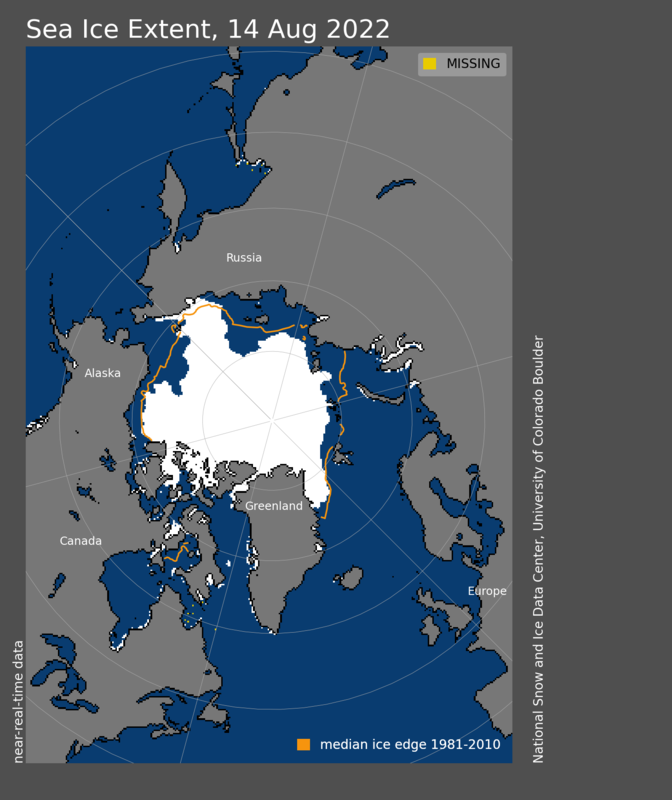 Recently the Arctic has warmed twice as quickly as the rest of the northern hemisphere. Some aspects of changing climate is self-perpetuating. Most sea ice is blanketed by reflective snow cover. About 80% of the sunlight striking snow-covered ice is reflected back into space. Further, when soot from smokestacks in Europe and Asia migrate to the Arctic then settle onto the snow and ice, the darker particles absorb rather than reflect solar energy. When sea ice melts, it exposes the darker, non-reflective ocean surface. Instead of reflecting solar energy, ocean water absorbs 90% of the incident solar radiation. As ocean water warms, arctic temperatures rise. Sea ice data from the National Snow and Ice Data Center in Figure 1, indicate the mean monthly sea ice coverage has decreased between the years 1979 and 2012. 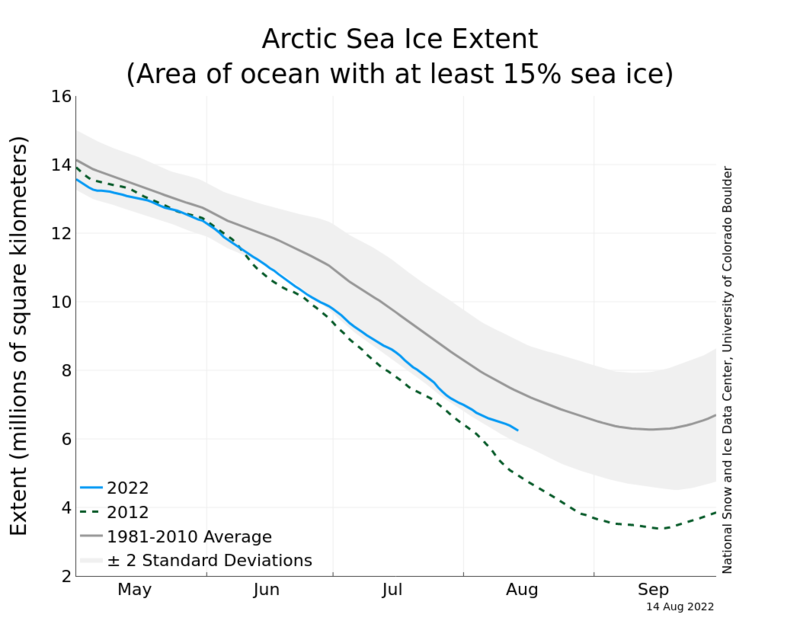 A plan view representation of sea ice extent is shown in Figure 2. 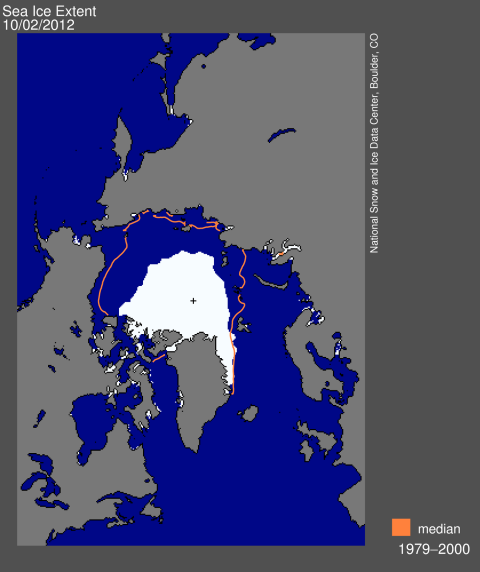 The white region, representing the footprint of sea ice on October 2, 2012, is shown in comparison to the median footprint of sea ice during the period of 1979-2000 (orange outline). Earth Scientists know from the geologic record that polar ice has changed over the last 12,000 years. Changes have occurred because of varied solar radiation and absorption. Further, on a geologic time scale, ice cover has grown or shrunk because of climate variation. Sea ice is melting more dramatically each year. Scientists concur the melt is driven by climate change correlating to pollutants humans release into the atmosphere. A 2012 study of multi-decade sea ice variability concludes that 70 - 95% of the disappearance of Arctic ice since 1979 is due to human activity. Arctic ice melting at 'amazing' speed, scientists find, David Shukman, Science Editor, BBC News. 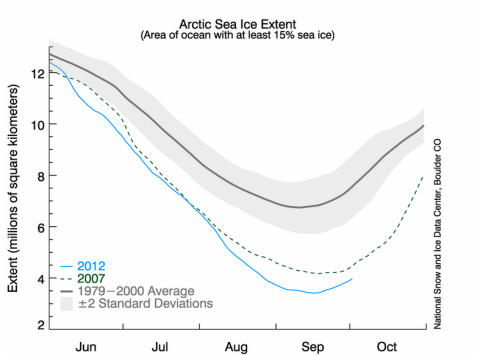 Arctic sea ice just hit a record low. Here’s why it matters, Brad Plumer, Washington Post, August 28, 2012. Sources of multi-decadal variability in Arctic sea ice extent, J J Day, J C Hargreaves, J D Annan and A Abe-Ouchi, Environmental Research Letters, Volume 7, Number 3.